The most overlooked bit of totally essential home hardware, the sump pump keeps your foundations dry and your basement free from dampness. You might have only realized it was there when you found out it had stopped working and noticed the waters rising. They aren’t glamorous but they’re the workhorses of your home, if you live in a high water table area or struggle with water in the home, you’ll need a sump pump. You’ll save your foundations and therefore your entire house, as well as preventing the respiratory conditions and infections that can come from having standing water in the home. Sounds like a good investment? Definitely. Read on for the best sump pump reviews on the web. Whether you’re looking to install one or replace one, you’re in the right place. But Why Should You Trust Us? Why should you trust this website to recommend the best sump pump? Good question, we’re skeptical of what we read on the internet too, as everybody should be. That’s OK, but we hope we can reassure you a little by giving you a few little facts. After all our testing and comparison, we’ve made what we think is the 10 best sump pump review out there. There’s plenty to choose from and you’ll find a broad range of prices and capabilities in our list. What Are Sump Pumps & How Do They Work? Sump pumps are well named, they’re pumps for a sump. That’s not very helpful, I know, so here’s a better explanation. In most homes there is a place in the basement that is lower than the rest of the floor, this is the sump, it’s where water accumulates so it can be removed efficiently. It might be that water is rising through the foundations due to a high water table, or that water is flowing down into the house from runoff. Either way, your sump pump sits down there and pumps water up and out into a drain, where it can safely flow away from your house. Sump pumps are large electronic motors that use pipes and differential pressures to extract water in sometimes large quantities. Most sump pumps are hard-wired into the house’s electronic system and some have a backup battery for when the electricity supply fails, a battery is definitely a feature to consider in your sump pump choice. 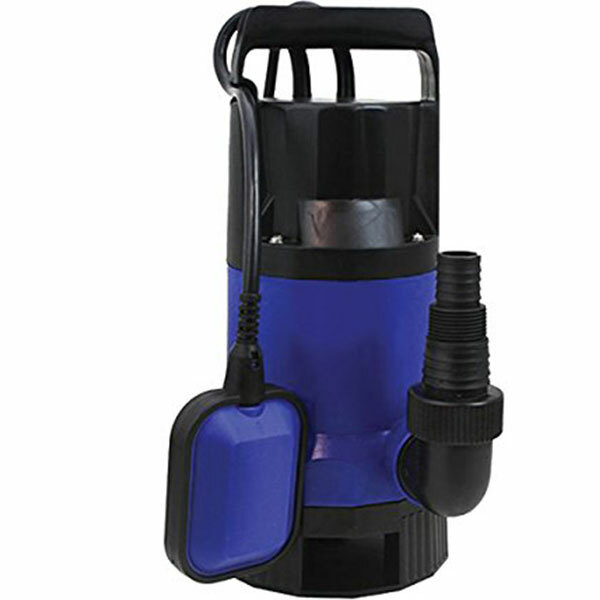 Some sump pumps are powered by the home’s potable water supply, which can be very useful if the power supply goes out. However, they can be more expensive and environmentally damaging (you’re pumping perfectly good water away) to use than an electrically powered sump pump. 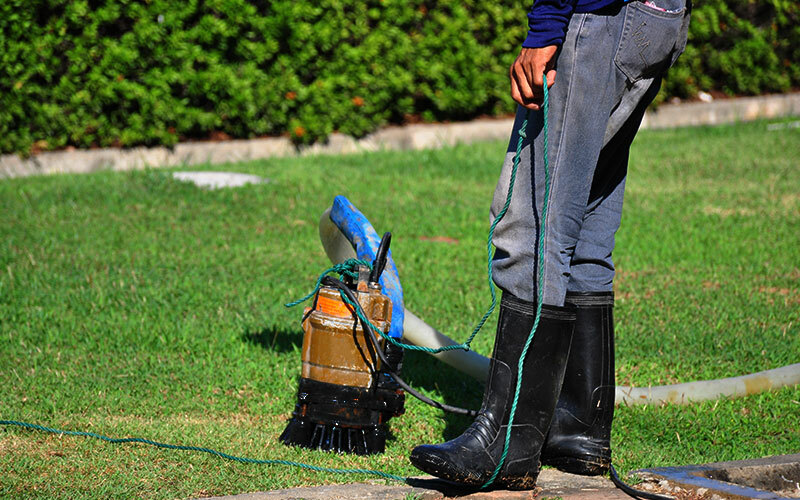 Sump pumps can be suited to indoor or outdoor use. What Size of Pump Do You Need? If you’re simply replacing an existing pump that previously worked well, match the horsepower (HP) to your old pump. If the reason for you replacing the old pump was that it wasn’t powerful enough and struggled with the amount of water in your sump, you should try the next horsepower level up. At a minimum, you should be looking at a ⅓ HP sump pump for a new application. A weak pump will be worse than useless. If there’s constantly a lot of water that needs to be pumped from your basement, we suggest at least a ½ HP sump pump, it’ll be able to pump significant amounts of water. As a rule, the further your pump is from the sump, the more power you will require from the machine. Ideally, place the sump pump as close to the sump as possible, but if this isn’t possible, you need to factor in the greater distance of pumping into your HP calculations. For a sump pump the depth of 10 or 12 inches, a vertical switch model is advised. For any sump pump, we recommend a Flotec Emergency Back-Up Pump system, which provides power in case of the electricity supply cutting out or your primary sump pump failing. This extra peace of mind is worth far more than the cost of a backup. There are two main types of sump pump: the submersible and the pedestal. Most pumps will come within these two definitions. There are battery and outdoor versions of both. A submersible sump pump is one where the motor is completely submerged in oil, making it very difficult for moisture and dirt to get into the workings and corrode them. Alongside corrosion protection, the oil provides constant lubrication and an efficient way of getting excess heat away from the motor. Submersible pumps, electronic or water powered, are quiet and neater than other types of sump pumps, they’re also much less tempting for curious children who might want to explore the workings and hurt themselves. The less expensive option, a pedestal sump pump has a motor suspended above the sump driving a chain that moves the impeller in the pump. Pedestal pumps are cheaper because they’re simpler, they’re easier to maintain (though they require more of it because they are exposed to dust and moisture) but a pedestal is louder than a submersible. Electronic or water powered pedestal options are available. Construction: A cheaper sump pump, submersible or not, will generally require a higher level of maintenance, break down more often and have a shorter lifespan than a more expensive model. Operation: modern sump pumps have very good automatic functions but some users will prefer a manually controlled pump. The conditions in a sump can change quite dramatically and require manual control to get the best use out of your pump. Do you need outdoor operation?. Power consumption: the horsepower rating of the pump is a good indicator as to the amount of power it will consume, but higher rated and more expensive models often have more efficient motors in, so can cost less in the long run. Check the energy rating on the machine and do a little calculation before you buy, you’d be surprised at how much a more efficient machine can save you. 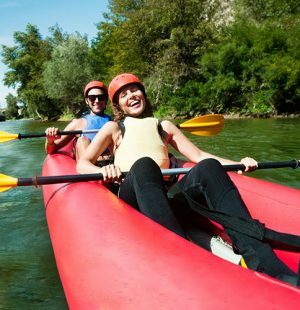 Water or Electronic (and Battery) Powered? Power Cord Length: will it stretch to where you need it to? Measure before you buy. Phase and Voltage: there’s nothing like buying a pump, only to find it won’t work with the power settings in your house. Switch Type: will it work with existing systems and your preferences? Backups: in a flood, often the first thing to go is the electronic system, so a battery or water power backup can save the day. A battery backup pump is good for very damp conditions. Who are Sump Pumps For? Sump pumps are found in more houses than you might expect. Your house might have one that you don’t even know about. It’s good to check! If the water table is higher than the foundations of your house, you’ll need a sump pump, no question about it. Even if the water table isn’t that high, the area your house lives in might be susceptible to flooding, whether from a rising water table or from surface water. In either case, you’ll be needing a sump pump to keep your house and valuables safe. Check with the local government for flood reports and the water table in your area, they’ll have reports with advice as to whether you need to install one. As your neighbors (if you have any), they’ll know the conditions better than anybody and be able to recommend what you need. 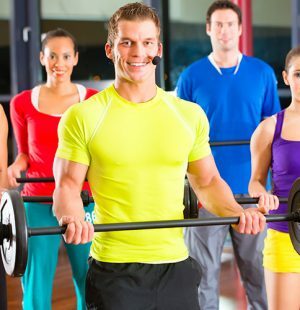 If you’re planning on setting up a home gym in your basement, sump pump is a must. Working out in a moist environment is severely hazardous to health, specially to respiratory system. Also, your gym equipment will not last longer if you don’t keep your home sump dry and crisp. Sump pumps are much more efficient than they used to be, they can cost a few cents a day to run, if that, depending on your conditions. For a few dollars a year in running costs you get to keep your house and all the contents safe. Sump pumps are immediately and obviously beneficial to some homeowners (i.e. those at regular risk of flooding), but some households might not notice the benefits for years until conditions change. If the conditions of your house aren’t so risky, say one flood in 20 years, your sump pump is likely to sit in your basement and not do much until that flood comes along. This is when it will pay itself off a thousand times. Peace of mind is what a sump pump buys for most people. They don’t cost that much and the electrically powered ones are much more efficient. It’s a form of insurance, having a sump pump, and compared to the costs of buying, installing and running one, they’re one of the best investments around. Your insurance company will likely demand that one is installed in order to insure you properly, so our top 10 best sump pump reviews could help knock a lot of money off your insurance bill. For our best sump pump reviews, we used our honed selection process, perfected over 4 years of intensive testing of dozens of different products. It worked well for the sump pumps too. First of all, we sent out our team of volunteers to find as many sump pumps as were available and bring what they thought was worth a look back to us. This generated a lot of data, so we consulted a few experts in sump pumps and used their invaluable insight to whittle down the list to something we felt was manageable. Out of 50 potential sump pumps, we tested around 30, giving us a very broad view of what was available on the market and the things to look for in our best sump pump reviews. None was perfect, as expected, but our selection process gave us our 10 top-rated sump pump list. During our selection process, our staff and volunteers focused on the design, construction materials, whether the device was automatic or manual, the power and power consumption, pressures attained, cord length, phase and voltage, switch types, backup systems and the length of warranty available, amongst a host of other factors. For our best sump pump reviews, we collated all that data and produced this article on the best sump pump out there and the competition. For our best sump pump reviews, we analyzed 39 of the most important features for each product in our list. We compiled all this into a handy report that is freely available to our readers. All you have to do is like one of our social media pages and all that data (plus plenty more) is available to you. 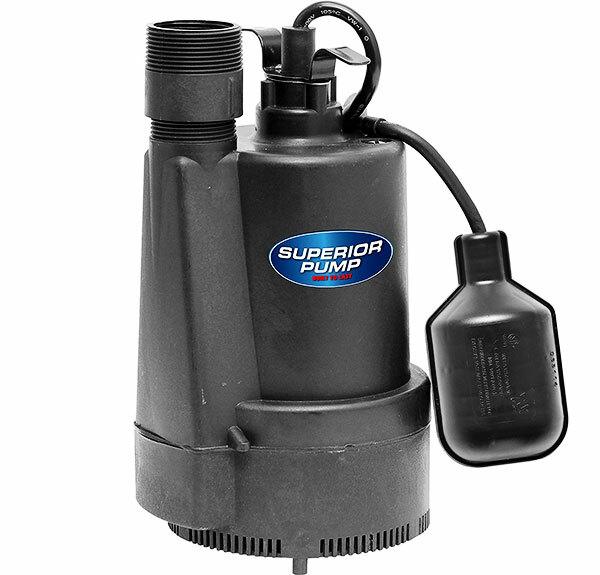 This sump pump takes top position for its impressive features such as a powerful & heavy-duty built, high flow rate at 77-gallons per minute, plus it comes with a 5-year manufacturer’s warranty. products we reviewed and with all the 39 different features we compared, this product had the maximum number of positive features available. This comparison showed us how high quality this pump is. By looking at our research report, you can tell that this submersible, heavy-duty pump is a deceptively rugged and powerful machine, able to handle nearly any water volume you’re likely to encounter in your basement. Able to pump 5673 gallons in an hour, there’s not much this machine can’t handle. Even though it has so many positive features, it’s still well within the affordable price range. We compared the ratings frequency of the WAYNE CDU980 on Amazon and found the rate it received positive ratings to be very favorable. This is in our freely available research report. Our Pick has a well-deserved reputation for reliability, long-term trouble-free operation and comes with a 5-year warranty. For less than $145, there’s little that can compete with the WAYNE CDU980E. It’s lightweight yet deceptively powerful, weighing in at 12 pounds but packing a ¾ horsepower kick that is able to shift serious quantities of water. Constructed from high quality cast iron and stainless steel, this submersible sump pump has a reassuring feel of quality to it and performed very well in our tests. Shifting 77 gallons per minute, it’s a submersible that will be able to tackle the sump in even the largest of basements and in very difficult conditions. Installation was easy, as the manufacturers said it would be, it came out of the box and within an hour we had it up and pumping away. It has a floating switch that activates the pump when the water level gets high enough. This can be an area of trouble with some sump pumps but this one functioned admirably, pumping water almost immediately after the threshold level had been reached. It will run for as long as it takes to pump the excess water away, which isn’t very long at 77 gallons per minute. For such a powerful machine, it is relatively quiet, certainly not being perceptible in the rest of the house. It is well designed and has no little places that stagnant water will accumulate and smell terrible. Looking at the reviews online is a good way of getting a feel for whether the product we received is a one-off or a part of a more consistent manufacturing pattern. With an overall 4* rating on Amazon, it was rated well enough we thought. Generally, people were impressed with the construction quality and reliability, there were plenty of people who’d had this pump for a while coming back to tell the world how reliable it is. We can’t give you that kind of data, we don’t test for long enough, so it’s good to see. The 5-year warranty is a good indication of quality and should reassure many customers. An impressively powerful, affordable and reliable machine, it’s clear why this sump pump is our top-rated sump pump. The high flow rate, the ease of installation, the quietness and power, it all adds up to a highly recommended pump. Why is this product our Runner Up? This heavy-duty sump pump features a vertical float, top suction that lessens the chances of clogging, and a powerful 1/2HP motor that can work efficiently to remove water from your basement. Our research report, which is free for you to read and full of essential information, tells us this is another great pump from WAYNE, having as many positive features as our top pick and lots to put it well above the rest of the league. This submersible’s epoxy coated steel motor housing and rugged, cast iron pump is very similar to our top pick but the maximum flow rate is lower than the winner, at (only!) 4200 gallons per hour. The frequency of positive ratings on Amazon is good but no better than our top pick. It’s still got one of the best ratings in this best sump pump reviews list. All this made it our Runner Up choice. 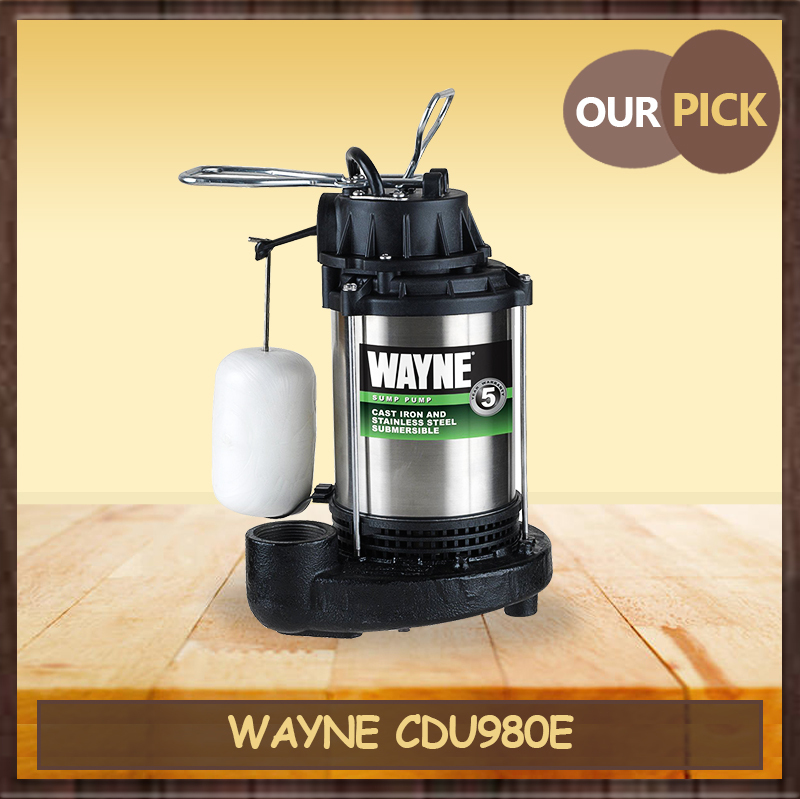 Like its more powerful cousin, the CDU980E, the WAYNE CDU800 ½ horsepower submersible sump pump is a fantastic choice for many sump pumping situations. 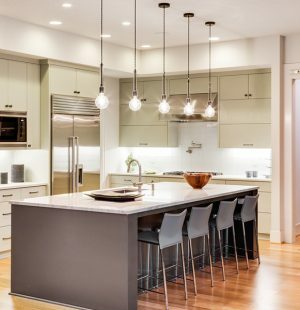 WAYNE pride themselves on the ease of installation of their products, and with good reason. We had this pump up and running in about an hour, a blessed relief after the fiddly installations of some of the products in this review. Replacing or installing a sump pump is not a glamorous job and can be quite a chore, so it’s great to find a product it’s so easy to use and install. Not only is it easy to install, the ceramic seal it forms is extremely tight and well suited to harsh conditions. The cast iron motor is submerged in oil, which even when at full power, doesn’t get warm enough to worry us. Reassuring. The float switch worked well and was sensitive enough to make the machine work very efficiently, only requiring short operating periods of a few seconds a time to drain a normal sump. It’s designed for sumps of over 11 inches, so bear that in mind. 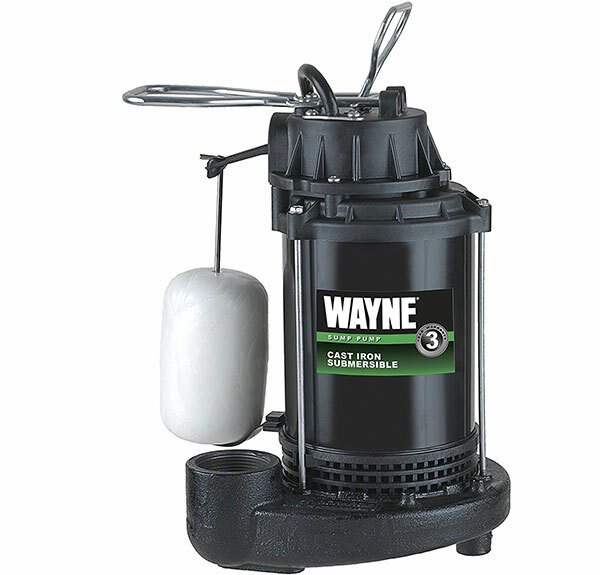 Equipped with a ½ HP motor, this WAYNE (made in the USA, incidentally) can pump serious quantities of water in a short time, meeting the demands of most households in most conditions. This lower rate would struggle in serious flooding but with just a rising water table or occasional downpours, it’ll do just fine. A neat touch is the top suction, meaning it will clog much less easily than other designs. 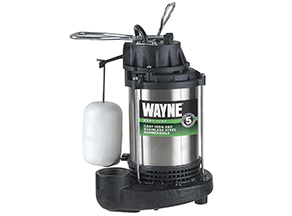 For less than $125, it is a heavy duty piece of kit that will make short work of your sump pump problems. It comes with a 3-year warranty but from what we can tell from the solid construction, it’ll last much longer. From our investigations of the ratings online, we found that this machine has a fair 4* rating and a good positive review rate. We can’t give you data on reliability, other than our feel for a machine, so the reviews point us in the right direction. 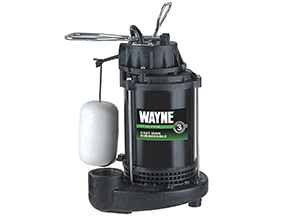 Falling in the affordable range, this WAYNE is a capable and reliable tool for less demanding sump pump conditions. It’d struggle with biblical flooding but it’s not designed for that. Cheap and powerful, it’s an excellent Runner Up. 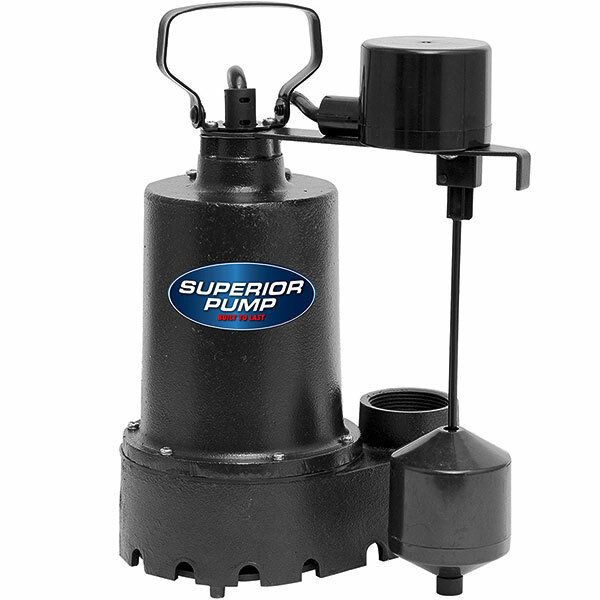 The Superior Pump is a relatively low cost sump pump with a great number of positive features such as a ½ HP motor that pumps at a rate of 2760 gallons per hour, a cast iron construction that’s solid & quiet. The mixture of economy, quality, and versatility on show here at a low cost makes this Superior Pump our Budget Pick, as you can see from our research report. 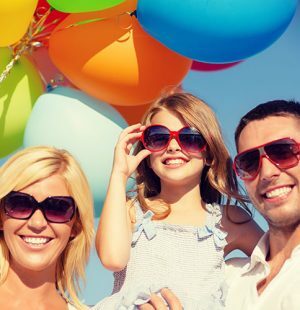 While it doesn’t have the lowest price of all of the products listed here, it has the highest number of positive features for the lowest cost. With a maximum flow rate of 2760 gallons per hour, it can still operate in many situations. The solid copper wiring is durable and the dual seal prevents failure caused by water getting into the motor housing. You can have all these features for a cost of less than $90, the reason it’s our budget pick. ⅓ of a horsepower is a lot of power considering the low cost of this sump pump. Its admirable rate of 2760 gallons per hour is easily enough for many houses, given that most people don’t live in flood-prone areas. When considering your choice of sump pump, the cost is one factor and how much the machine will have to pump is another. If you’re replacing a sump pump of a similar power, you can expect this sump pump to replace it well, giving a reliable and powerful service over its lifetime. It’s only got a 1-year guarantee but it seems well made to us so should last longer. For a budget household, this could be the answer. The sealed, submersible cast iron construction is solid and quiet, made out of one piece of material for extra reliability, the vertical float switch was sensitive and worked reliably, and the installation was relatively easy. There’s a smart filtering system from the bottom suction design, meaning your pipes won’t get clogged too easily. The filters are easily cleaned, a major bonus. The 10-foot cord should be enough for most situations and if the pump is raised 10 feet above the sump, you can expect a rate of 1800 gallons per hour instead of 2760. This is actually a good rate and gives the customer (possibly you) the choice of concealing the pump easily. We looked at how it was rated on Amazon, a good place to see such things, and found that it was a really popular choice, with lots of people buying it and rating it highly. As far as we can tell, it’s reliable and the customer support is good. It’s an efficient machine with a split capacitor functioning as a two gear system, one to get it up to speed and another for continuous pumping, meaning it consumes much less energy than a single capacitor device. A low cost yet powerful and easy to use device, this sump pump makes for an affordable yet reliable choice for a budget household looking for something with a lower pump rate but enough power to handle a lot of situations. With proper maintenance and care, this pump can serve you for years without breaking down. 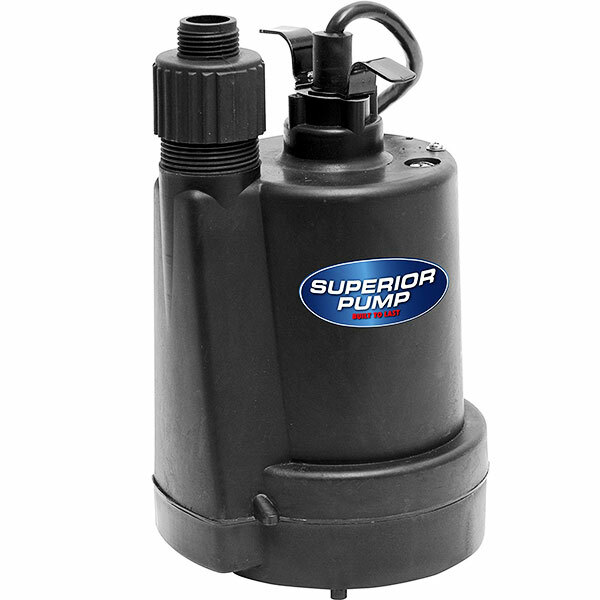 This pump for Superior Pump is a normal utility pump that also works as a sump pump, with the simple addition of a float switch. It pumps at a rate of 30 gallons per minute, is portable & reliable. This is our multipurpose pick because our research report (have a look for free!) tells us that while it is normally a utility pump, an optional float switch can be added to make it a sump pump. Small and durable but exceptionally powerful considering, it can give a 30 gallon per minute rate at up to 25 feet from a sump or water source, making it a potential house saver. It’s small size mean it can fit into an entrance as small as 6 inches. Designed to drain water in any environment, it can be relied on due to its split capacitor motor specially designed for continuous duty, as well as being thermally insulated. All this for a very reasonable price and the best customer rating frequency on Amazon of all the tested products, getting 10 positive ratings in the first 2 days, 10 more in the next 4 days and the next 10 in 5 days. While it’s not a dedicated sump pump, we definitely thought the multipurpose abilities of the Superior Pump worth including in our list. Not every house needs a dedicated sump pump, but a lot of houses are built in places where occasionally one will be needed. A burst water main or flash flood can ruin a house if an adequate pump isn’t on hand to remedy the situation. And that’s exactly what this one is: it’s a versatile indoor and outdoor pump you can have ready if things go wrong. Normally, it would be used for pumping standing water out of any different environment, but if you attach the float switch, it becomes a very capable sump pump. A 30 gallon per minute rate isn’t as high as some of the dedicated sump pumps, but it’s still a very respectable rate, especially considering it can be installed up to 25 feet away to get the water out of your basement and into somewhere you can deal with it better. Considering its portability as well, the versatility of this pump will be extremely useful in a lot of situations. It can attach to a garden hose, a really neat feature. One of the best parts: it’s cheap, at a cost of less than $50. It is tiny as well, making it easily concealable if you need to. Even though it is cheap, it is also made from reinforced thermoplastic and comes with a double seal, making it difficult for moisture to enter the interior and corrode the parts. Submersible means it is relatively quiet, a relief when disaster has struck and you need to get some shut-eye. It’ll soldier on in the background very nicely with its split capacitor continuous motor, which is both efficient and designed to be on for a long time. It is suitable for outdoor use. The float switch is sold separately, so be sure to pick one up if this is your choice. A machine this versatile is a very valuable machine indeed, especially considering the very low cost of purchase. It’s no toy though, with a high pump rate and a well designed, durable shell and motor. 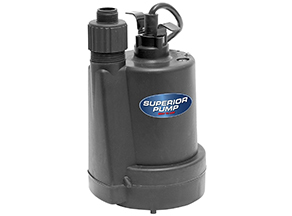 This pump from SumpMarine is lightweight and easily portable, its compact design makes it easy to install & uninstall as needed. It can also function both as a regular pump & sump pump efficiently. The reason for this being our best Compact Choice is that it has a small, compact and lightweight design but a full range of useful features. The second lightest of all our tested products, at 8lb, it has a durable and oil cooled ½ HP electronic motor, preventing short circuits while submerged. As it is so portable, it doesn’t have to be permanently installed, meaning it can be installed in a basement to save the owner thousands of dollars by removing water, then taken away easily. It might be almost adorably small, but this submersible pump is no toy. It’s a serious tool for a serious job, it can be submerged up to 16.5 feet to pump out very large quantities of water. At a surprisingly low cost of under $43, you’ll find the SumpMarine SM10102 very good value. It’s small and lightweight but packs a serious punch. The real advantage of a machine this size is that it can be installed on a temporary basis. Install it when you need it (and the installation is relatively simple) and take it away when it’s no longer needed. For houses and businesses that need a sump pump solution only part of the time, this pump is well worth considering. It’s versatile too, having a number of options for the outflow, meaning you can employ it in a number of different situations to great success. It runs at 115 volts and has a 250-watt motor, providing the power needed to shift the large quantities of water it is capable of. It deals with dirty water remarkably well and the filters can be changed easily. Reading some reviews on the internet, there do appear to be some issues with reliability and difficulties with returning the faulty machine, but overall people seem to be pleased, comparing it favorably with much higher end machines. Issues with durability and reliability can be expected at this price range, you’re really not paying much considering the capabilities, and that versatility comes at a cost to manufacture. That isn’t to say it is badly made, it’s not, it just can’t have the construction values of a higher end model. Cheap and cheerful we’d say. One issue we found was that the cord for the float can pop out, meaning that the motor was pumping air and would have burned out if we’d not spotted it. Other than that, we were generally pleased with the machine. Our research report has the information you’ll need to make a great choice. 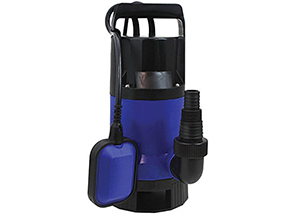 Cheap and cheerful, portable and powerful, this is a good choice for someone looking for a small, low-cost pump that can function as a sump pump as well. Some issues with reliability but at the lower than $50 cost, you can’t complain too much. The Zoeller sump pump is solidly built, has a powerful 1/3 HP motor than can pump out large amounts of water in a short period. It’s a pricey sump pump that’s well worth the investment for its reliability. Aptly named, the Mighty-Mate is a very solid and powerful machine. The ⅓ HP motor can push out a large quantity of water in a relatively short amount of time. Very solidly built, it is a pretty heavy machine made to be installed and left to its own devices. This it will do admirably, having a very high quality of construction and a smart, well-tested design. It’s a cast iron submersible, meaning there will be very little maintenance and you can expect it to run for a long time with no trouble. Available for less than $160, it isn’t the cheapest sump pump around but it has the quality to back up the slightly higher price. 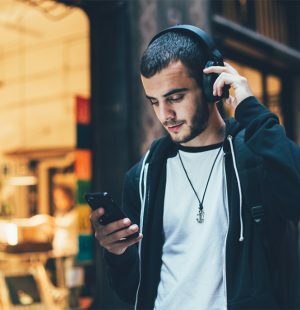 Not many of the devices we reviewed felt as solid or as reassuring, it is well worth the investment. Check our report for more info on this pump. The manufacturer boasts that it has a “non-clogging vortex impeller”, so we decided to test this out. It survived what we could throw at it, so we’re going to approve this nonclogging boast. It’s good at keeping itself running. Up to 2 inches wide objects can pass through the pump, meaning not much will get in its way and you can rely on it to keep on pumping in a desperate situation. The float switch works well, turning the pump on and off efficiently and there was no chance of the pump being on when there’s no water. This is a brilliant way to kill a water pump, so we were relieved. Zoeller makes a good range of very popular sump pumps, and this one is a very good seller for them. There are a lot of very positive reviews, with this Mighty-Mate ending up with a 4.5* rating on Amazon, one of the highest around and especially good considering how important it is to get the right pump. A slightly less affordable but very justifiable sump pump, the Zoeller M53 Mighty-Mate has a high flow rate, superb construction and an excellent reputation for reliability. It’d be higher on the list if it weren’t for the higher price. We have seen people investing heavily in home security system, but when it comes about sump pump they often become skeptical. Investing in a good quality sump pump might not bring the result over night, but you can avoid unexpected disaster by having one. Zoeller will be a little heavier on your wallet, but its superior quality and features will surely worth every penny. Another sump pump from Zoeller, it is made of heavy cast iron and painted with corrosion resistant coating, and is designed to be screwed into place for a long-term efficient pumping job. 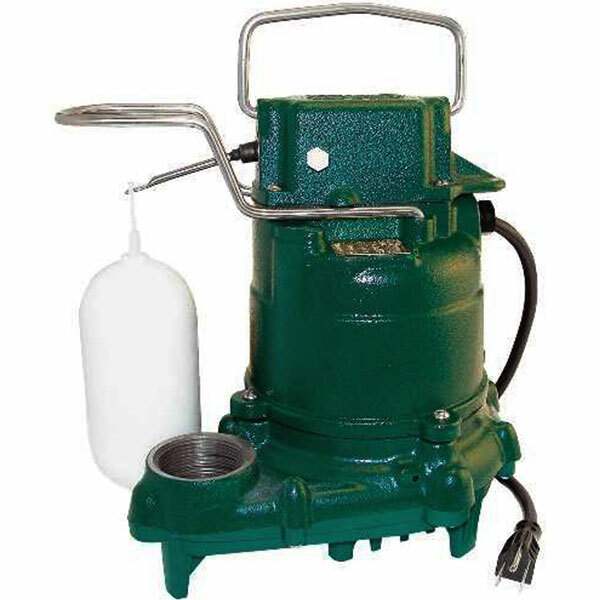 Another fine product from Zoeller, the 57-0001 M57 is a high capacity sump pump that runs very efficiently. At ⅓ of a horsepower, the motor isn’t as powerful as some but it still produces enough power to keep most households out of the flood and in the dry. 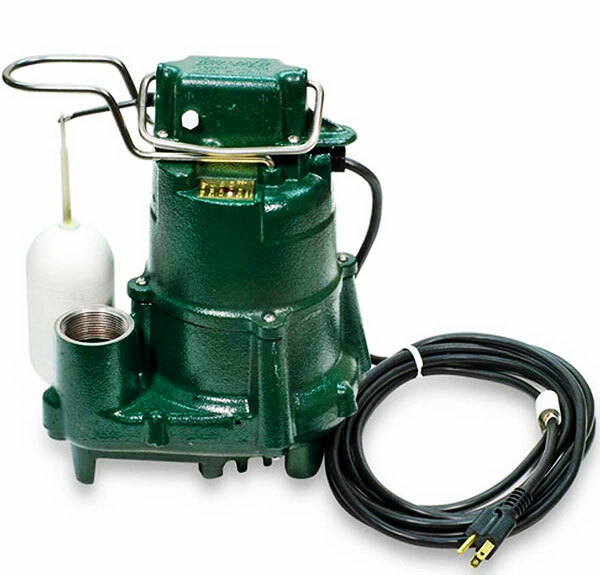 It’s a heavy, cast iron, corrosion resistant painted and epoxied sump pump that has a very solid feel to it. This is a machine to screw into place (not as easy as some to install but certainly not too onerous) and left to pump away. All the parts that are exposed to the air or to moisture are stainless steel, it’s all designed very nicely to be in damp and dirty conditions and still do its job with no issues. The square ring between the motor and pump housing is made of neoprene, which can perish after a number of years, but for a long time will provide a very tight seal. A submersible sump pump like this is designed for low maintenance, the neoprene ring is the only part we could find that would look like it would need replacing in a 10 year period. Overall, it’s a reliable machine, going from the reviews on the internet. 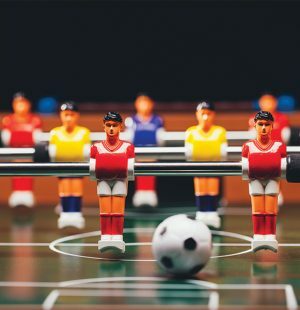 Amazon gives it 4.5* and the number of positive reviews is very high. While there are occasional issues, nothing major reared its ugly head during our reviewing process or in the reviews of other people. Manually controlled and with a variable level long cycle, it’s perfect for the household that experiences a differing level of water intrusion and needs that element of control to deal with the different situations. At a cost of under $180, it’s not cheap but it’s worth the extra cash, we think. Our research report has more data you can use to help your choice. The solid cast iron construction means it isn’t light, weighing in at 27 pounds or so, but it should only need moving twice, once when you put it in and once when you take it out, years later, when it finally dies. That should be a long time in the future if we’re any good at predictions. Which we are. Solid, cast iron construction is what we like to see and it’s what you get here. This ⅓ horsepower machine is a reliable and durable sump pump that costs a little extra but justifies it. 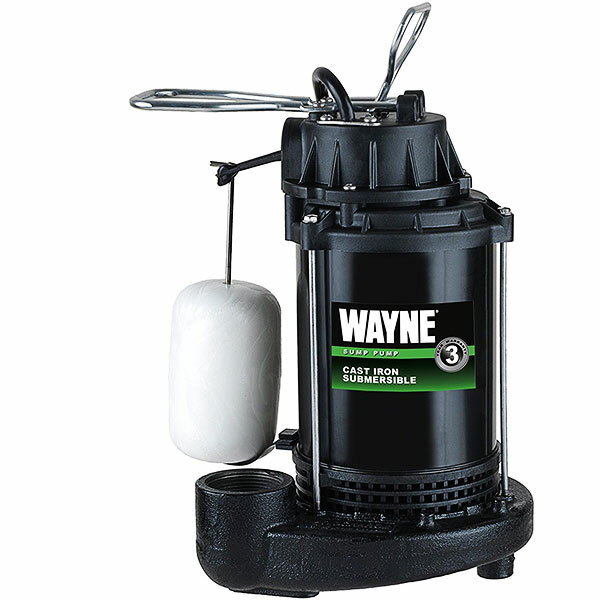 Another sump pump from Wayne, this pump is solid and well-built, delivers a great job at a rate of 3800 gallons per hour, with a cast-iron housing and heavy duty motor pump that does an efficient job. For sump basins larger than 11 inches, this sump pump is a pretty good choice. It doesn’t quite offer the value of our Picks but is still worth a mention. You can pick one of these up for under $111, which places it firmly in the affordable range. For a ⅓ horsepower pump, this is very reasonable. 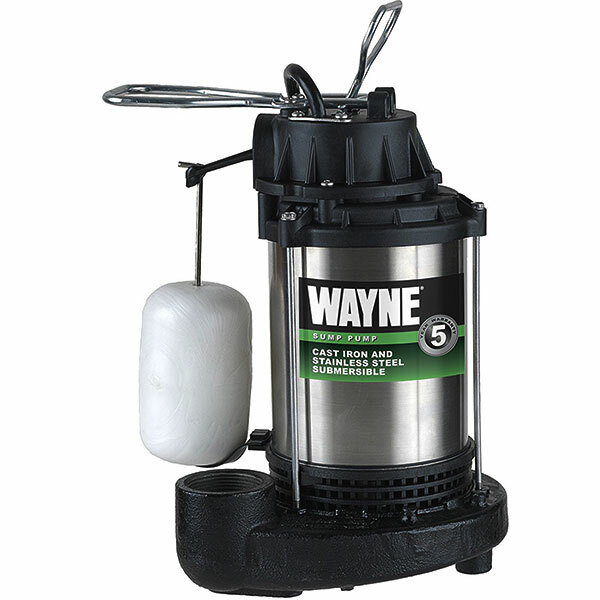 Like the other WAYNES, it features top suction, stopping a lot of the clogging that plagues other machines. During our testing, we found that it was very easy to install, another feature of the WAYNE machines, and worked very reliably when we threw all sorts of conditions at it. They’re heavily tested in the factories, so it’s no surprise that these machines have a good reputation for reliability. The mechanical float switch worked reliably, meaning the motor was used efficiently and the right quantities of water were being pumped out. No pumping air (Priming) on this machine. Construction wise, it’s pretty solid, being made from thermoplastic that is both heat resistant (from the hot oil surrounding the motor) and tough, though it can be a little brittle. That isn’t a worry as we’re unlikely to drop it. You just install it and leave it alone, it’ll do its job for a long time, with its cast iron pump housing and heavy-duty motor. The maximum capacity of this pump is 3,800 gallons an hour, less than many. But considering the reliability and construction values, this could be a perfect choice for a less demanding situation. 3,800 gallons is a lot of water, so it will still suit a lot of different houses and businesses. There’s a 3-year warranty on the machine and the reviews on the web indicate that it’s a reliable choice, just like the rest of the WAYNE products we’ve tested for this review. Affordable, well constructed and with a 3-year warranty, there’s a reason this is one of America’s most popular sump pump choices. The 3,800 gallon per hour rate is respectable and ideal for a lot of households. This Superior Pump is affordable & delivers a respectable 40 gallons per minute rate, comes in a small, compact design that’s also ideal for smaller spaces and basements with a sporadic water table. With a range of flow rate from 2400 gallons per hour with the pump at water level, and 1680 gallons per hour with the pump raised the 10 feet the cord will allow, this ⅓ HP sump pump isn’t the most powerful we’ve reviewed but it does a good job. Not every household needs a high rate of flow, in fact, having a too high rate can damage pipes and equipment, so it’s always best to get the one suited to your situation. It still pumps out up to 40 gallons a minute, so it can handle a heck of a lot. Well suited to a smaller basement or an area with an intermittent water table, this Superior Pump will install quite easily and do a reliable job. It will pump down to a very low level so there will be very little standing water to go stagnant, never a good thing. We can’t test for reliability here at our offices, but we can tell you what the general consensus is, and that is that there are a few problems with the machine giving out after a few months, but the vast majority keep working for a long time. The construction is of reinforced thermoplastic, with a double seal to prevent moisture getting in and spoiling the works. It’s not as tough as a full cast iron model but a slight scratch in the plastic won’t result in it corroding, so that’s a definite advantage. There’s a 1-year warranty, and given that most of the faults we saw happened in the first few months, this should ensure you get a good one that will last much longer than the warranty. 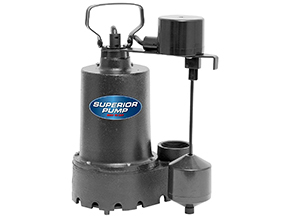 Superior Pumps are well designed, they rarely get clogged or suffer from mechanical failure, so this is a sump pump that is fine to be left to its own devices. For less than $80, it’s a low-cost choice that could suit you. If you know the basics of how pumps work, this model’s bold and superior features will definitely catch you attention. A small, affordable and efficient choice for a smaller household or business, thus Superior Pump gives a lot for its small size, pumping up to 40 gallons per minute and staying cool while it does it. Another solid Zoeller sump pump, this powerful pump boasts of a durable heavy-duty cast iron & stainless steel construction that weighs 39 pounds. It’s ½ HP motor can pull out 3060 gallons of water per hour. Not the best reviewed of our top ten, this only gets a 3.5* rating on Amazon, which is a shame because the one we used worked pretty well indeed. It’s a solidly built, cast iron, corrosion resistant painted and epoxied sump pump that will give a reliable result to customers. It is not cheap, at a cost of under $215, it’s the most expensive sump pump we’re reviewing here, and the reason for its low rating is partially the price. Putting out 3060 gallons per hour, it makes short work of most water tables and flood risks, and while it isn’t the most efficient of the ½ HP pumps we’ve seen here, it does a good job in a tough situation. One particularly appealing thing about this pump is its extremely heavy duty construction. Weighing in at 39 pounds, it’s by far the heaviest pump we’ve reviewed here, but that weight comes from an extremely solid build. Cast iron casing and stainless steel parts make it a device that will resist corrosion for a long time, as well as being very reliable. There’s a 12-month warranty on this Zoeller, which is OK. But for this kind of price, you might expect a longer one. It doesn’t seem like enough, given how well it seems to be constructed. The reviews are revealing, it seems that there have been issues with this machine failing in the first few months or years of use. For $215, it should last a bit longer than 12 months, and the vast majority of people are getting that kind of reliability. Its vertical switch was efficient, the manual controls worked fine and the automatic settings are easy to work with. It’s a workhorse of a machine that should do the trick for a flood-prone area or a very high water table. Despite some poor reviews, this machine presented itself very well to us, having a very solid construction and a well thought out design. It is powerful, heavy duty and durable, if quite expensive. The care and maintenance of your sump pump is vitally important, your house and belongings are at risk if you don’t, so here’s a quick guide. Have a backup. Simple as that. Know how it works, read the manual twice and test every setting. Getting the right settings means it will last for longer and save you money. From our research and testing, we found most of the problems occur due to improper installation of the pumps; to be specific, the installation of discharge line. Even if your sump pump is of high quality and expensive, if the discharge line fails, its of no use and you’ll end up in massive jeopardy. Getting the care and maintenance of your sump pump wrong can leave your house uninhabitable and your possessions destroyed, so it’s worth 5 minutes every now and again to check it’s all in working order. We hope that you’ve enjoyed our guide here at Stuffoholics and found it quite helpful. Sump pumps are pretty boring when it comes to it, and it’s a major chore to find a good one, but that’s why we made this review for you. It’s a way of making a dull task much easier, or at least that’s what we hope. Have a look at our research report for more data, it’s a really useful and clear way of making an accurate comparison. Ask a few questions before you buy: what kind of flow rate do I need? How much will it cost? What kind of pump am I looking for? That’s all for now, check out the rest of our site for more advice and guides, bookmark this one and come back for more!